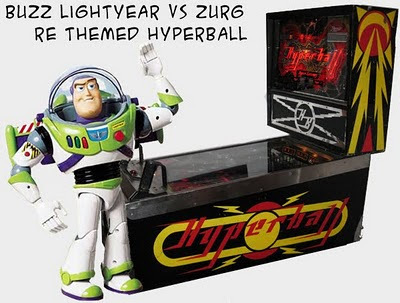 Just bought a Hyperball machine to re theme. I plan on making it Buzz Lightyear vs Zurg. Cabinet will be repainted, new custom backglass, remade playfield, LED lights and Custom made figures. I plan on having it done in time for the 2011 Pinball Expo in Chicago. Should be done sooner but I will have it at the Expo none the less. Lots of work ahead on it. Check here and my Facebook for updates on the project. New Spidie Sense plastics are done!!!! !